A janela minimalista conheceu um notável sucesso nas últimas duas décadas, continuando e enriquecendo o legado de um dos maiores ícones da Arquitectura Moderna — a janela horizontal e os envidraçados de correr. Partindo da experiência internacional da Jofebar — uma empresa com 30 anos nos sectores da serralharia, do vidro estrutural e das janelas minimalistas —, este livro oferece diferentes perspectivas sobre a janela e um panorama abrangente da construção e arquitectura contemporâneas. 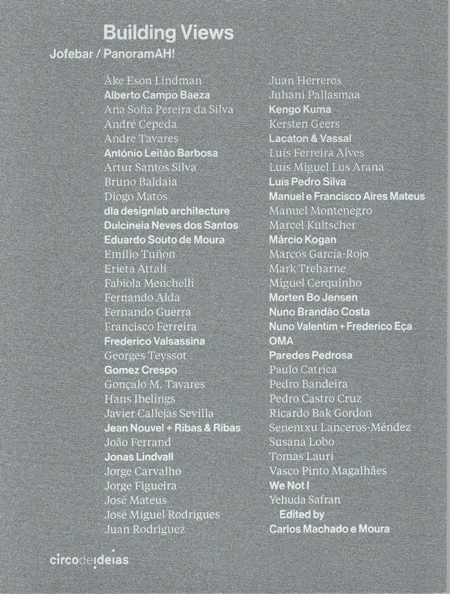 Entre os autores contam-se arquitectos, críticos, fotógrafos, escritores, empresários e académicos, que propõem um conjunto rico e articulado de imagens e contributos originais. The minimalist window has known a remarkable success for nearly two decades, pursuing and extending the legacy of a major icon of Modern Architecture — the horizontal sliding window and the glass window/wall. Starting from the worldwide experience of Jofebar, a thirty-year-old company in the field of metalworking, structural glass and minimalist windows, this book proposes to build different views on the contemporary window, architecture and construction. Contributors — including architects, critics, photographers, writers, entrepreneurs and academics — offer a rich and unexpected set of insightful texts and beautiful images.